Dying Vine can easily be considered a solid representation of the band Aletheian as a whole. Capturing the sound and spirit of the band, while living up to the intensity of the live show. A few tracks from the album actually pre-date the name change to Aletheian; original versions of some songs written around the same time that Crutch recorded ...hope prevails in 2001. These tracks did not fit into the Apolutrosis concept album in 2003, so they continued to be honed over years of live performances. These well seasoned tracks are complimented by some tracks that were written only weeks before recording sessions began in late 2004. So the material on Dying Vine spans a 3-4 year period of writing and performing, which contributes to the album serving as an identity statement for the band. 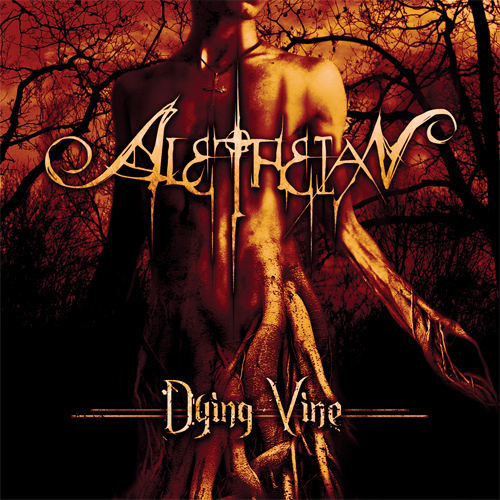 Beginning in the fall of 2004, and finally completing in the summer of 2005, Aletheian recorded the full-length album 'dying vine'. This project was completely self-produced, and Alex was the recording engineer, producer, sound tech, mixing/mastering engineer, as well as band member, guitarist, and bassist. Alex and Joe built a recording studio in the band practice space (which was the home of Joe Walmer) on a budget of less than $200. Equipment belonging to Hans/Studio Insomina was setup in the makeshift studio, and Alex kicked off the most intense project of his recording career up to that point (and possibly ever since). Joe Walmer was very insistent on not doctoring any of the drum recordings, so Alex (and the rest of the band) agreed, and no beat-detection or snap-to-grid alignment was used on the drum tracks for the album. Not long after tracking all of the drums for the album, Alex had an accident with a box-cutter blade and severed a tendon in his left thumb. This is a major problem for a guitar player, especially right before the recording sessions of a new album. Alex had reconstructive surgery by an excellent hand specialist, which was followed by months of intense rehab and physical therapy. Frustrated, in-pain, and concerned about his recovery, Alex continued to work on the album. During Alex's rehabilitation period, drum sounds were completed and Alex worked with Donny to track all of Donny's guitar parts and solos. All of this, as well as more of the 'dying vine' recording process is documented in a behind-the-scenes video tour and is featured on the Aletheian Live DVD. By the spring of 2005, Alex was playing guitar again, desperately trying to get back up-to-speed for recording and touring again. Several CD release shows had already been planned, and a full summer of touring to support the album was already in the works. Alex persevered and ultimately crafted the finest of all the Aletheian recordings. Guitars were tracked and re-tracked, and tripled, etc... Vocals were added close to last, and then a whirlwind mixing and mastering period concluded far too close to the production cutoff deadline. Joel and Hope Prevails Productions had to basically beg the CD manufacturer to finish and deliver the first run of final CDs and DVDs in time for the CD release shows. But in the end, everything worked out well, and the summer/fall of 2005 was a great time for the band. In early 2006 Aletheian was approached by IronClad Recordings, a sub-label of MetalBlade, run by Trevor from UnEarth. Ryan and Trevor from IronClad were impressed with Aletheian's work, and were interested in the band's next album. Through some negotiation, Aletheian convinced IronClad to give Dying Vine a shot at a legitimate release, with the conditions of some additional material. This condition led to the concept of adding a Cynic cover to help create a buzz and boost marketing appeal. Obtaining rights to the song "How Could I" for the re-release took a very long time, and by the time the song was recorded, the album was produced and released, Cynic themselves had reunited and released new material. So all marketing appeal of the cover track was lost.